I am a little down today. It's day two of no caffeine and I am feeling it. 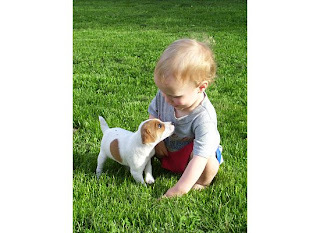 I stumbled upon this picture of my youngest son and one of my sister-in-law's puppies. I LOVE IT! Kisses and hugs, even if they are sticky. My husband helping me without being asked. The children's choir singing on Sundays. Snuggling with a baby while rocking him to sleep. Feeling the wet dirt between my fingers and the smell of the earth when I am toiling in the garden. Listening to loud music in the car as you are driving down the highway with the windows rolled down. I love hearing the "motor" sounds escaping from a room full of boys playing tractors. I love the sound of an ice cold diet coke fizzing with clinking ice. Watching the tall grass dance in the wind on the prairie. The smell of autumn in the air and the crunch of the new fallen leaves. New mascara, toothbrushes, and underwear. These are just a few loves that pop in my head.